BackgroundCrimean-Congo hemorrhagic fever (CCHF) is a tick-borne infection caused by a virus (CCHFV) from the Bunyaviridae family. Domestic and wild vertebrates are asymptomatic reservoirs for the virus, putting animal handlers, slaughter-house workers and agricultural labourers at highest risk in endemic areas, with secondary transmission possible through contact with infected blood and other bodily fluids. Human infection is characterized by severe symptoms that often result in death. 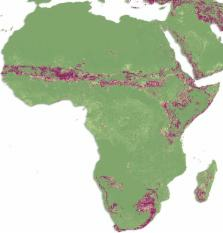 While it is known that CCHFV transmission is limited to Africa, Asia and Europe, definitive global extents and risk patterns within these limits have not been well described.MethodsWe used an exhaustive database of human CCHF occurrence records and a niche modeling framework to map the global distribution of risk for human CCHF occurrence.ResultsA greater proportion of shrub or grass land cover was the most important contributor to our model, which predicts highest levels of risk around the Black Sea, Turkey, and some parts of central Asia. Sub-Saharan Africa shows more focalized areas of risk throughout the Sahel and the Cape region.ConclusionsThese new risk maps provide a valuable starting point for understanding the zoonotic niche of CCHF, its extent and the risk it poses to humans. A working guide to boosted regression trees. 1. Ecologists use statistical models for both explanation and prediction, and need techniques that are flexible enough to express typical features of their data, such as nonlinearities and interactions. 2. This study provides a working guide to boosted regression trees (BRT), an ensemble method for fitting statistical models that differs fundamentally from conventional techniques that aim to fit a single parsimonious model. Boosted regression trees combine the strengths of two algorithms: regression trees (models that relate a response to their predictors by recursive binary splits) and boosting (an adaptive method for combining many simple models to give improved predictive performance). The final BRT model can be understood as an additive regression model in which individual terms are simple trees, fitted in a forward, stagewise fashion. 3. Boosted regression trees incorporate important advantages of tree-based methods, handling different types of predictor variables and accommodating missing data. They have no need for prior data transformation or elimination of outliers, can fit complex nonlinear relationships, and automatically handle interaction effects between predictors. Fitting multiple trees in BRT overcomes the biggest drawback of single tree models: their relatively poor predictive performance. Although BRT models are complex, they can be summarized in ways that give powerful ecological insight, and their predictive performance is superior to most traditional modelling methods. 4. The unique features of BRT raise a number of practical issues in model fitting. We demonstrate the practicalities and advantages of using BRT through a distributional analysis of the short-finned eel (Anguilla australis Richardson), a native freshwater fish of New Zealand. We use a data set of over 13 000 sites to illustrate effects of several settings, and then fit and interpret a model using a subset of the data. We provide code and a tutorial to enable the wider use of BRT by ecologists. Concern over implications of climate change for biodiversity has led to the use of bioclimatic models to forecast the range shifts of species under future climate-change scenarios. Recent studies have demonstrated that projections by alternative models can be so variable as to compromise their usefulness for guiding policy decisions. Here, we advocate the use of multiple models within an ensemble forecasting framework and describe alternative approaches to the analysis of bioclimatic ensembles, including bounding box, consensus and probabilistic techniques. We argue that, although improved accuracy can be delivered through the traditional tasks of trying to build better models with improved data, more robust forecasts can also be achieved if ensemble forecasts are produced and analysed appropriately. This is an Open Access article distributed under the terms of the Creative Commons Attribution License ( http://creativecommons.org/licenses/by/4.0/), which permits unrestricted reuse, distribution, and reproduction in any medium, provided the original work is properly cited. Introduction to the symposium Global Perspective on the Culex pipiens Complex in the 21st century: The Interrelationship of Culex pipiens, quinquefasciatus, molestus and others.